Baltimore City Recreation and Parks’ CAMP BALTIMORE! offers a variety of affordable and enriching summer camp options. Campers can look forward to a summer experience including academic enrichment, field trips, nature outings, sports and swimming. http://bit.ly/CampBaltimore2018. Our camps and clinics provide the opportunity to EXPLORE, LEARN, PLAY and GROW! Late pick up is at 5:30 pm and parents/guardians will be charged. Registration is open but some sites are full! Please note that a camp registration packet must be completed by a parent or guardian. AN ONLINE ACCOUNT IS REQUIRED TO REGISTER FOR SUMMER CAMPS. You must be registered to participate in any Camp Baltimore! program. A completed camp registration packet, including medical history and other required paperwork must be completed before a child attends camp. Age requirements must be met by the start of summer camp. Children must be signed in and out daily by the parent/guardian. NO EXCEPTIONS. Please be prompt for drop off and pick up times. Staff is not responsible for children before and/or after regular camp hours unless they are enrolled in Before/After Care. Children must remain in camp for the full scheduled day unless written consent is provided or they are picked up by a parent/guardian. Customers must withdraw prior to the start of a program for a full refund. 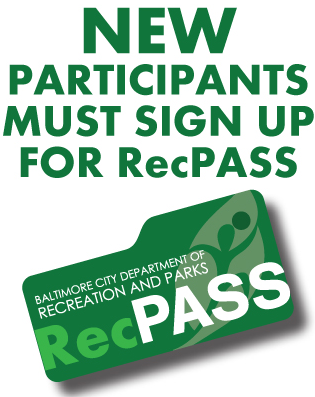 Programs that are canceled by Baltimore City Recreation and Parks (BCRP) will be fully refunded. Refunds requested after the start of a program will be prorated. Participants removed from any BCRP facility, event or program due to disciplinary action will not receive a refund. Please bring your receipt to the camp location and our staff will assist you. Refunds take 4-6 weeks to process. NOTE: The $25 deposit for Outdoor Nature Camp is non-refundable. Always check with your Camp Director for status updates, exceptions to this policy and make-up dates for canceled activities and trips. You may also call our weather line at 410-396-7022 or check our BCRP Alerts page. As a precaution, when temperatures exceed 95 degrees by noon, all recreation programs based outdoor activities will be canceled. Pool trips scheduled after 12 p.m. will be canceled. Rain may delay or cancel some outdoor activities. Lightning will cancel outdoor activities. Where possible these will be moved indoors or rescheduled. Baltimore City Recreation and Parks welcomes participants of all ability levels to participate in its programs. We make every effort to work with families to mainstream children with special needs into our programs. Dependent upon the accommodation needed we may refer your child to our inclusion camps, Camp Variety and Camp Variety Teens. In order to create a successful and enjoyable environment for your child, please make your request for special accommodations during registration. If you have any questions or concerns about online registration call 410-545-3369.